Experienced, innovative people and facilities. 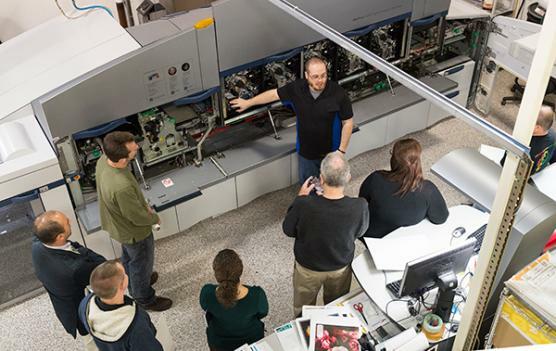 We support today’s international print/imaging business with solutions-oriented R&D, an array of corporate educational workshops and seminars, and digital media certification programs, product/process auditing, competitive benchmarking, and assistance with product development. MELVILLE, N.Y., Feb. 12, 2018 /PRNewswire/ -- As part of its continued drive to expand collaboration with key players in the large-format industry, Canon U.S.A., Inc., a leader in digital imaging solutions, is proud to welcome Breathing Color, a designer and supplier of award-winning digital inkjet canvas, papers, and canvas coatings, as a new member of the Canon Alliance Partner Program (CAPP) for imagePROGRAF Large-Format Solutions. Kodak and RIT’s Printing Applications Laboratory have worked for many years together on the qualification process for Kodak NexPress substrates. The RIT team has always provided excellent and timely support for this process for Kodak, substrate vendors and our mutual customers. The RIT team’s work is done with the utmost integrity and prompt responses, and is vital to the Kodak Nexpress platform’s ability to support the wide range of substrates both now and in the future. Idealliance has valued its partnership with RIT for more than 10 years. In 2006, Idealliance selected RIT to provide independent certification services for its G7® certification programs. Throughout its partnership, RIT has collaborated with Idealliance to improve our programs and, more importantly, advance color management and performance for the media industry. We have turned to the RIT team for expertise on a wide range of technical and supply chain issues. Their support is always grounded in reality and helps us and the industry become a more compelling and competitive industry. The Security Print Workshop is an excellent source of information. It is led by people who have a lifetime of experience and have seen all the major changes in the industry, from using lithographic stones to the digital technology of today. RIT brings in experts from all over the country to share their real life experiences in security printing. This workshop has made me more aware of the many aspects of security printing. The setting is perfect for learning since it is sponsored by a major university and they do it in a way that is personal and inspiring. I would recommend this workshop to anyone involved in security printing in order to enrich their career and help them create a more secure product that stops counterfeiters in their tracks. ACTEGA was incredibly overwhelmed and extends its sincere appreciation to the entire staff at Rochester Institute of Technology that assisted in creating one of the most successful National Sales Meetings we have had to date. From the event planning to the printing application knowledge, the on-hand staff could not have provided a more energetic but relaxed environment for our group. ACTEGA holds RIT in high regards with respect to its services relevant to our industry and will certainly recommend its services to industry partners.